They wouldn’t move, so we had to step over them, anywhere and everywhere: sea lions sleeping on a flight of stairs; marine iguanas resting mid-walking-trail; and Boobies – blue footed and not – perched atop jumbled volcanic stones blocking crude footpaths, watching us as we walked. These creatures acted like this was their land, which it had been since its creation. This was their Galapagos Islands, part of South America’s Ecuador and 600 miles west of the mainland. I wasn’t interested in visiting the Galapagos Islands because I do not like creepy, crawly species of any kind. I decided to go because so many people had asked me if I had been there. That recurring question told me to go. In the end, I am glad I went. What I was seeing and experiencing was OK, but it really blossomed on Espanola Island. 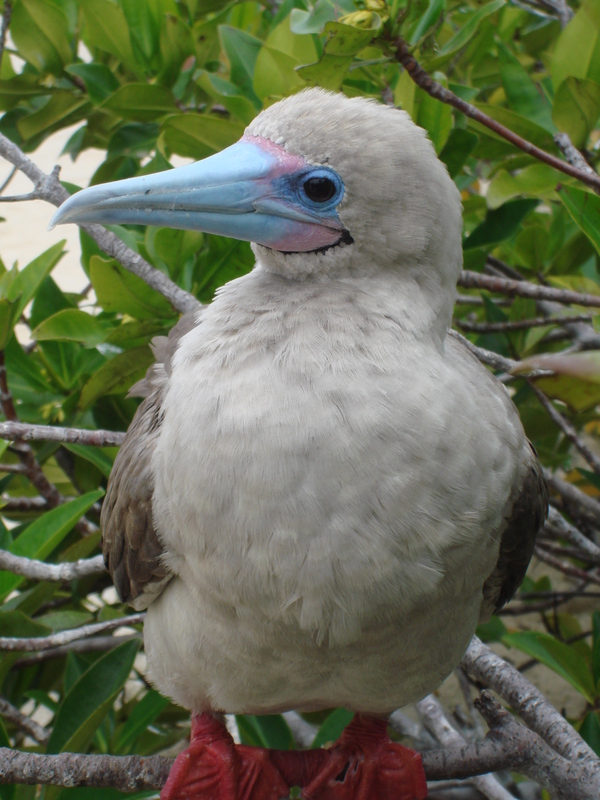 Walking along the white sandy beach, we rounded a corner to find precious Frigate Birds and Blue Footed Boobies with their babies, all in nests. Well, I just lost it. These little angel babies were all fluffy as cotton under their mothers. They looked just like six-inch tall “Big Birds”. Only thing that was so unusual about it, though, was that the mother and baby were within my arm’s reach. 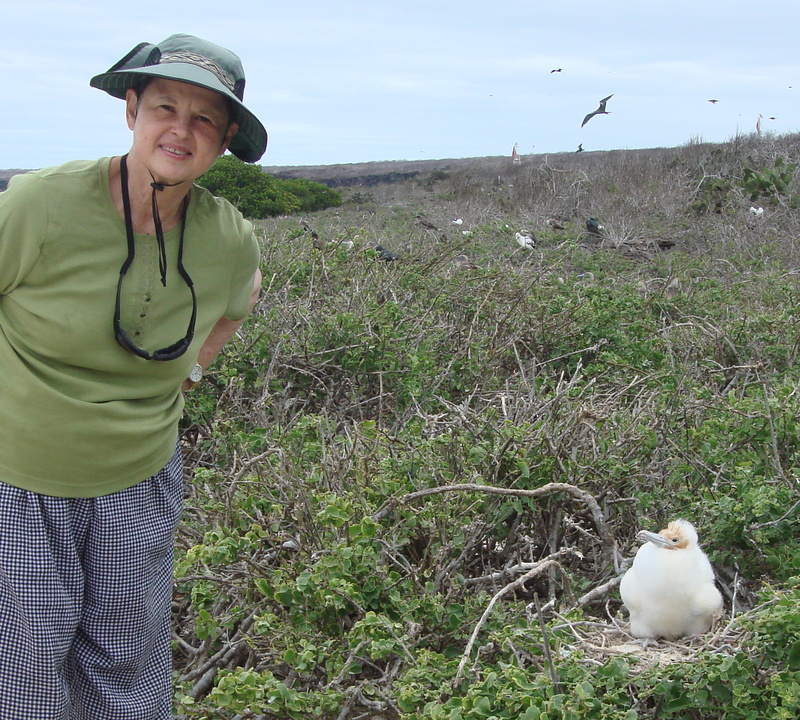 In all of my life, I had never been that close to nesting birds without them flying away. These birds did not move — ever. When mother was gone, baby just waited quietly in the nest until mother returned. And to beat it all, those babies either had blue feet, red feet or grey feet! As we continued walking the path, nesting birds were everywhere — in the trees and bushes within plain sight — just looking at us like we were looking at them. They did not move or otherwise alter their behavior due to our presence. 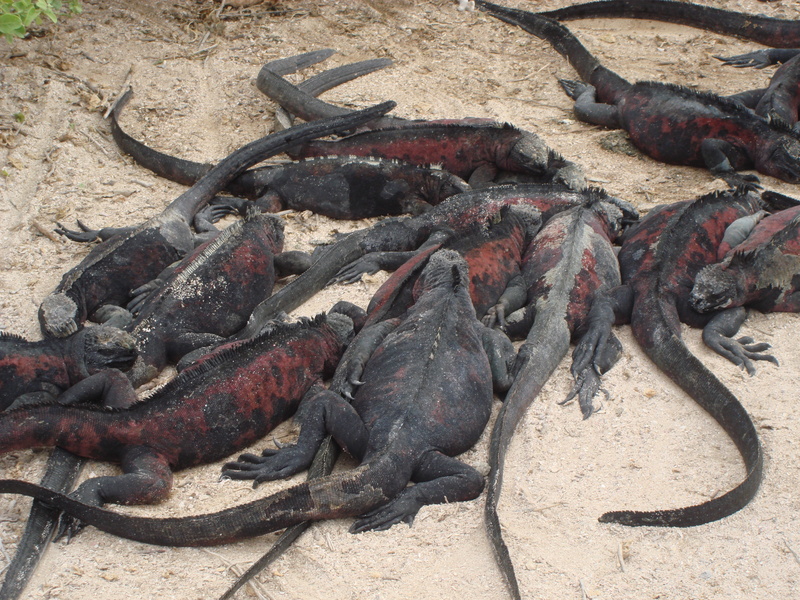 Further down the trail, we came upon a pile of black and reddish iguanas that we had to step over. 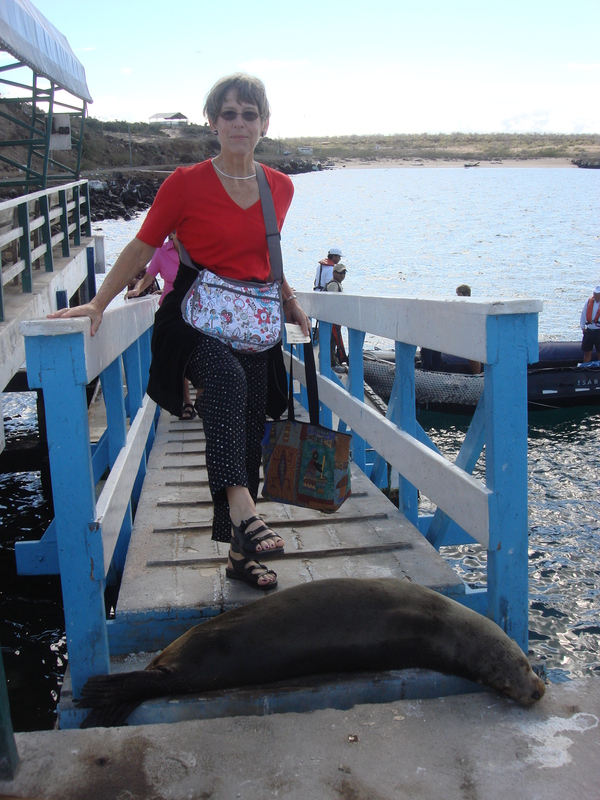 We stepped over wildlife for the entire cruise around the 9 Galapagos Islands we visited. Multitudes of creatures were everywhere. It was pointed out to us that the creatures were there first so they are used to their island, day in and day out. Also, humans have not heavily hunted them (except for the giant tortoise). So, other creatures walking around do not faze them. The Giant Tortoises were on Santa Cruz Island at the Charles Darwin Research Station. Giant Tortoises weigh 600 pounds, are about four feet tall at the high point of their shell with legs about six-inches in diameter. 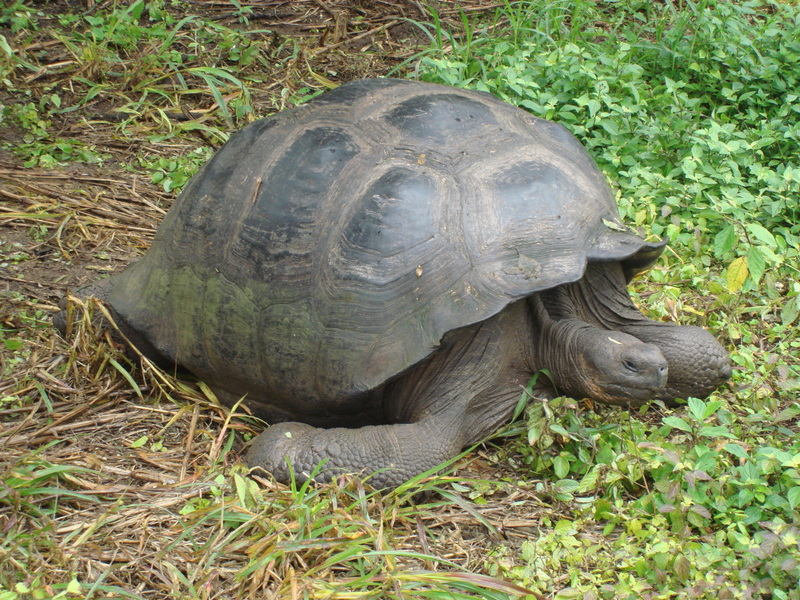 “Lonesome George,” the last of his Pinta Island species, is still looking for a wife despite being over 100 years old. At one time, a $10,000 reward was offered to anyone who could find a female mate of the same species as Ole George. The shape of their shell –saddleback, dome-shaped, and intermediate – identifies each Giant Tortoise species, each evolving on a different Galapagos island. Giant Tortoises like Lonesome George are being raised at the Darwin Center for future generations to enjoy. 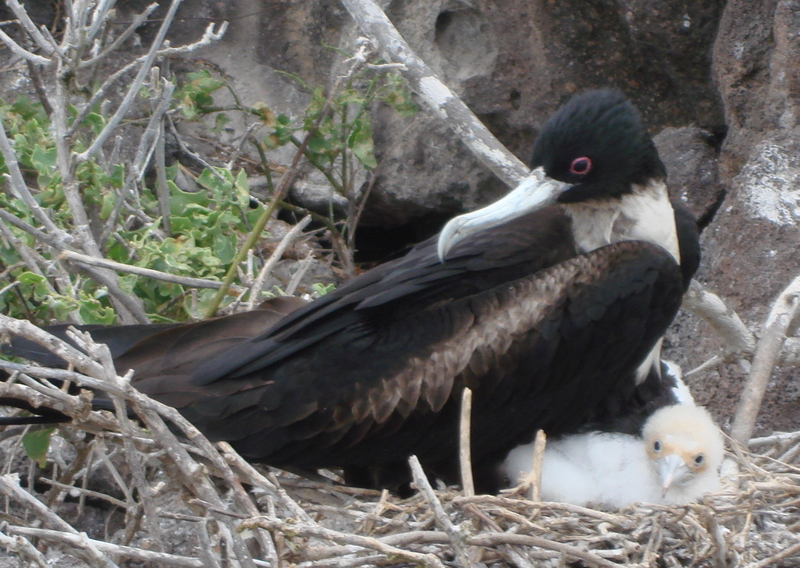 We saw them in the egg, incubation, infant, teenager and adult stages. But we couldn’t leave all the rare Galapagos species without seeing the Galapagos penguins, the only penguin that lives as far north as the equator. We were getting ready to leave when two Galapagos Penguins popped-up in the water, busily doing their thing. 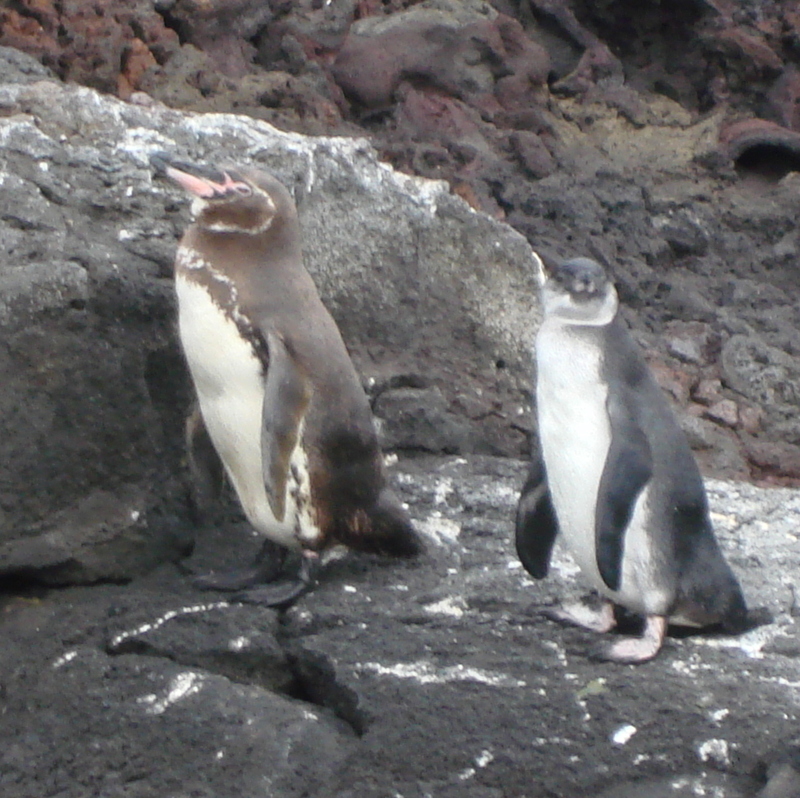 About 10-12 inches tall, the Galapagos Penguins are the third smallest penguin in the world. They came to Galapagos riding in the Humboldt Current that comes from Antarctica up the west coast of South America. This cold current makes the equator-bound Galapagos Islands cool in August, a welcomed surprise. 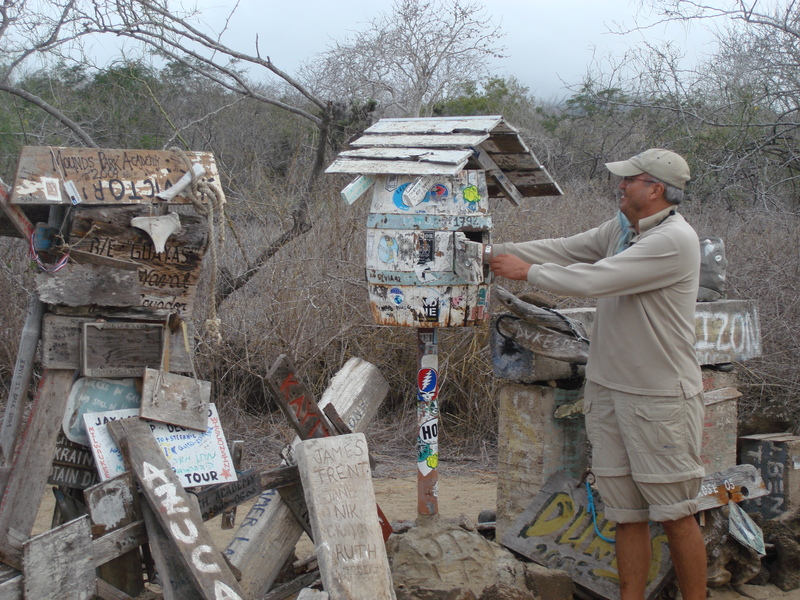 Our final experience was the Galapagos Post Office, and it was a one-of-a-kind. Here, you are the post person. You write a postcard to someone and then mail it in the whiskey barrell. Then another tour comes along and all the postcards are taken out of the whiskey barrell and locations read. If you live in a town that is named, you take the card home and “deliver” it to the listed address. And the best part – no postage was required and delivery was guaranteed rain,shine, sleet or snow. Now if we could just find George a wife.